Hello, colouring air dry modelling clay is possible with pencils. 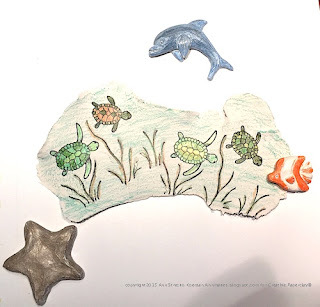 Today over at the Creative Paperclay® Blog where I am a Designer on the Design Team I have a post where I share my latest attempt at playing with the CP clay. So it turns out that once the clay is dry it is possible to colour it with regular colouring pencils! I coloured some embellishments I had made and found the results very pleasing. I also found that it is possible to stamp an image onto a flat piece of Creative Paperclay® and colour it with pencils or crayons. Here is an example of what I tried. I hope that this quick tip inspires you to try colouring air dried clay too. Thanks for stopping by.